In retirement I have returned to my first love of Humanities and the Arts, in particular the field of music history, focussing on the activities of pianoforte makers in 18th - early 19th century Britain, notably the Anglo-Irish inventor, William Southwell. My first academic paper in this field, ‘Piano Wars: The Legal Machinations of London Pianoforte Makers, 1795-1806'’, jointly authored with Professor George S. Bozarth of the University of Washington, Seattle was published in The Royal Musical Association Research Chronicle (2009) Vol. 42, 45–108. ISSN 1472-3808. An abstract of this paper is available. 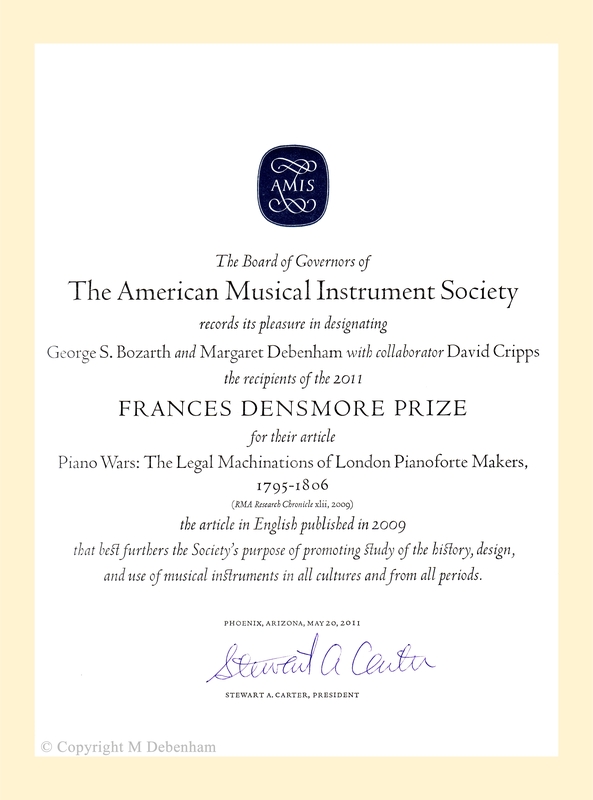 In May 2011 our work was honoured by the award of the Frances Densmore Prize by the American Musical Instrument Society for ‘the most outstanding article on musical instruments, written in English, during calendar 2009’ (image © copyright M Debenham). Most of my research in this field is perforce undertaken from home, via the Internet and using e-mail, since declining health makes travel and spending time in archives impractical for me. Whilst in my case this approach has arisen from physical necessity, the constantly expanding ranges of indexes and original source material available on-line are creating exciting opportunities for all historical researchers. It is my intention to write up a research methods paper on my experiences of using the medium for this purpose in due course. I should also pay tribute here to the kind assistance I have received from family members and colleagues (they know who they are) who have on a number of occasions visited archives to look at documents ‘in situ’ on my behalf. Friends of Square Pianos Webmaster: David Hackett. Square Piano Tech A resource for the restoration of 18th and early 19th Century Square Pianos. Webmaster: Tom Strange.